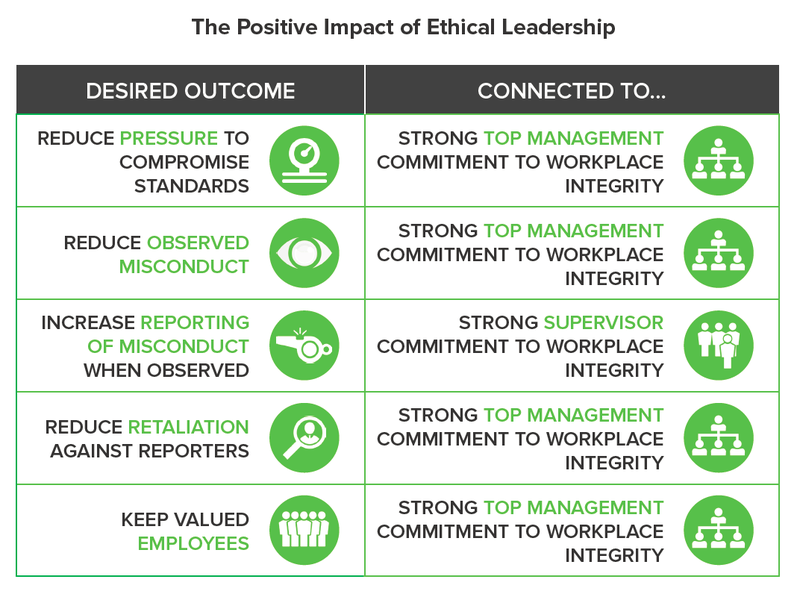 The Ethics and Compliance Initiative (ECI) recently released a report, “Ethical Leadership Around the World and Why It Matters,” as part of its Global Business Ethics Survey. Among the results, researchers found that ethical leadership is key to lowering ethics and compliance risk. Unfortunately, they also found that leaders tend to have a more positive perception of their own and their organization’s integrity and ethical behavior than their employees do. Fortunately, leaders, with the support of L&D organizations, can take steps to improve their ethical leadership skills. Mike Esterday, CEO of Integrity Solutions, defines ethical leadership as “doing the right thing because it’s the right thing to do.” Beyond that, he points to integrity as a key value, saying that in a study of Fortune 500 companies, the most common professed value (identified by 57 percent of the companies) is integrity. Organizations led by ethical leaders tend to have higher employee engagement and lower turnover. Esterday says the most important point is to address ethics in leadership training. “Too many companies focus on product knowledge, job skills and factual knowledge. These are foundational and required, but it’s passion and the sense of purpose that drive people to excel.” He adds that ethics should be included in training for employees who don’t hold leadership positions, as well. Harned says it’s also important to develop performance metrics based on ethical behavior to hold leaders accountable. Develop performance metrics based on ethical behavior to hold leaders accountable. In an age where ethics, or the lack thereof, can make or break a leader’s career and mean the difference between success and failure, it’s critical that organizations be able to identify ethical leadership and develop managers who behave with integrity and accountability. Following these tips will help.